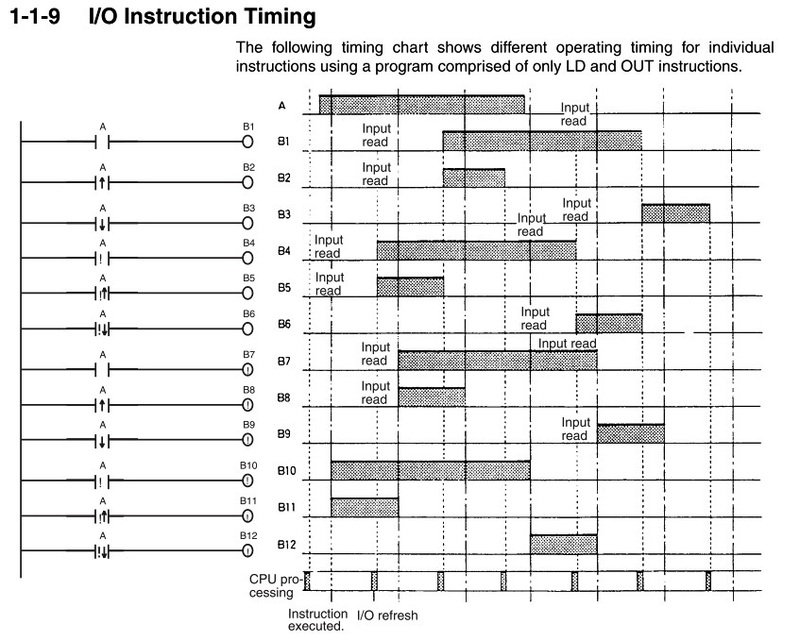 I'm sorry guys to take space here with such a basic problem but I'm a bit confused by the I/O Instruction Timing table that I found in the manual (see the pic please). Basically, I always thought that the status of the individual bits will be reflected in the program just after the I/O refresh, that is the PLC will check the physical inputs, copy them into the image memory and use them (update) in the following scan. But by looking at the table, it's not apparently true. I can see that in case of B1, after the I/O refresh there is a full scan where the B1 is still OFF and it come ON only the scan +1. Only when I use the (!) then in works the way I thought it should work even with a simple contact. Can someone explain to please why there is the full scan gap? The term stands for "I/O Refresh", so it does things for both physical Input and Output, but has no relation to the timing of when the Instruction itself is executed. For the case of B1, one I/O Refresh cycle detects that the "LD A" instruction returns TRUE. After that you get another "Instruction Executed" cycle. On that particular time the "OUT B1" instruction will return TRUE, however the actual Physical Output itself will not changed to TRUE since the next I/O Refresh is not yet executed. That's why it looks like you need to wait for extra scan, but what really happens is that you wait for the next I/O Refresh. Using the "!" modifier on the "LD A" forces an extra I/O Refresh to be conducted at the start of the Instruction Execution. Then on the same cycle, the periodic I/O Refresh fires again. That's why the Physical Output of B4 can be turned on in a same "Instruction Executed" cycle. Thanks a lot for your response. I didn't realize that the diagram is actually showing when the Bs are reflected on the outputs and not it the program itself. Could you just confirm for me please (or correct) that the working bits work the same way as the physical ones? I.e. The B1 would behave the same way for Y:101.01 as for W0.00?